Can I bring my class for a field trip? While we do host some class field trips, our primary focus is research. Please contact Pam Fashingbauer with your information and what kind of experience you were hoping for in the field trip. Is Trout Lake Station associated with the DNR? No. We are part of the University of Wisconsin-Madison’s Center for Limnology. 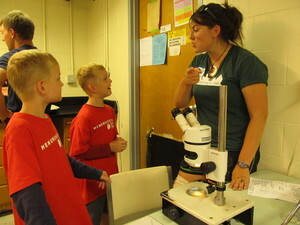 We do collaborate with the DNR in research and conservation efforts. Are speakers available for my lake association’s or civic group’s meeting? Yes. Please contact the station to schedule a research specialist to visit. Can you answer questions about my lake? We perform a broad range of research across many lakes in the Northern Highland Lakes District. While we welcome questions, not all lakes have been studied extensively. We will answer your questions to the best of our knowledge. Can you help identify the aquatic plants or animals in my lake? Certainly, we have many specialists available to identify any species brought in to our station. Our laboratories are equipped with fume hoods, two systems to provide high-quality purified water suitable for chemical sample processing, drying ovens, a muffle furnace, balances, pH meters, a spectrophotometer, fluorometer, gas chromatograph configured for greenhouse gas analysis, and a liquid scintillation counter. A set of three light-and temperature-controlled incubators are available for experimental projects and culture maintenance. We have 6 dissecting and 2 compound microscope stations. Two dissecting scopes are equipped with a digital camera and computerized measurement and counting system. A Zeiss inverted microscope is equipped for epifluorescence. The laboratory has a series of large fiberglass holding tanks, four 75-gallon fiberglass aquaria, assorted small aquaria, and a controlled-temperature incubation system for primary production measurements. Portable generators and pumps allow the use of holding tanks at remote sites throughout the region. In addition, a wide variety of other analytical equipment is available on the Madison campus.For further information, contact Pam Fashingbauer.